TechyKids made a visit to Chester High School with an invitation from their Science teacher, Ms. Goldstein. Chester High school is a Title I school, and many of their students are on free or reduced lunch. 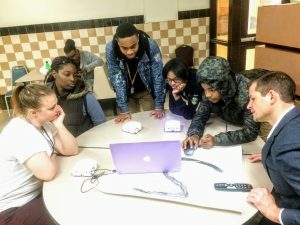 After learning with the Thymio robot and TechyKids, the high school students showed high engagement and a strong interest to learn more and even pursue coding in their future.